Our cousin, Mike, has been one of our biggest supporters since starting the comic. He was also responsible for the first and many other guest strips. It’s only fitting that he’s given us this awesome guest strip this round. Check out some of his earlier guest stuff here. For the record, I really would take the Ninja Turtles over Mario any day. I’m embarrassed to say I would have said the same thing in the last panel. Nice mash-up! Two cartoons and a video game…. Always fun! Thank you for the kind words Saeed! 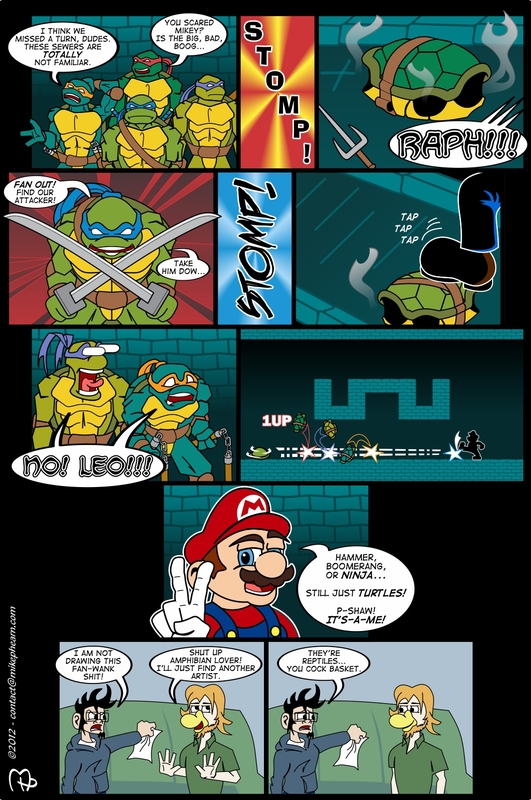 I am actually much more of a turtle fan myself, but considering the “world logic” of Mario, I am not thinking the “heroes on a half shell” would stand much of a chance. Really fun, Mike! Love how you worked the game seemlessly into the panels! Thank Mark! I was quite happy with that too. The “W” like shape in panel 8 is a stylized, but tile for tile, recreation of that piece from the game. Now that’s a good battle. That. Was. Stupendous! Turtles all day, e’ry day. I love Mike’s style! I must find more of his work. Thank you sir! Sadly not much in the comic department. I work all day creating glass awards and trophies. It kinda leaves my creative brain “drained”. I love when I get the chance to do this stuff though. It’s actually the writing that is my biggest time challenge creatively. I always make time to draw. Thank you very much Jenn! I love your stuff too! Most of you posing here are real inspirations to me. I wish I could put the dedication in that you all do for your comics. To be clear, I have not seen everyone here’s stuff yet. Those I HAVE are awesome, I am sure the rest are to! I will try to check you all out!